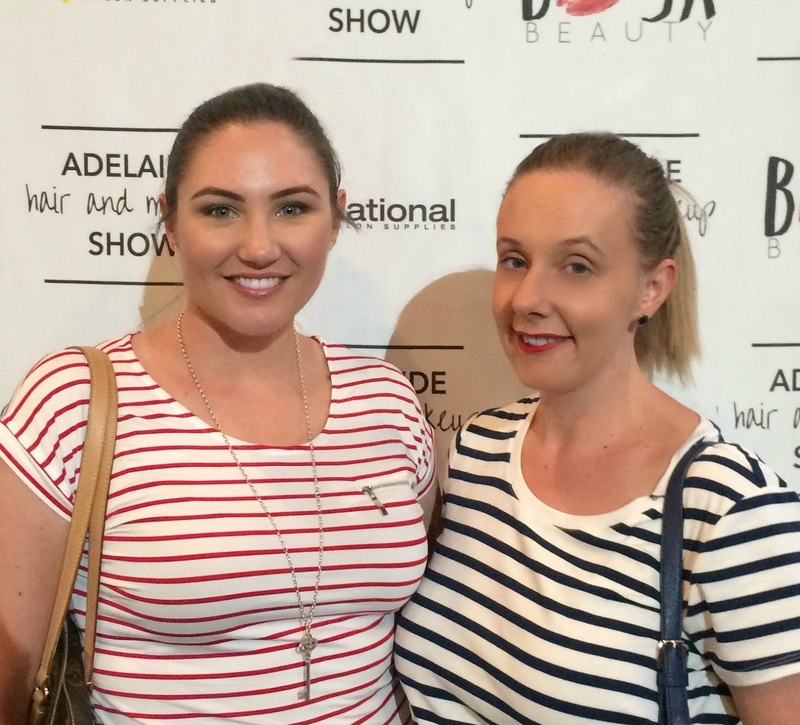 Over the last weekend, I went along to the inaugural Adelaide Hair and Make-Up Show at the Convention Centre. To have an event like this here in Adelaide for the first time was most exciting as we're usually looking East with jealous side-eyes. I met Bridie in North Adelaide for a nutritious breakfast of croissants and coffee at Butterfingers before strapping on our wristbands (SO IMPORTANT) and walking through the beautiful spring day to the Convention Centre, stopping for a footbridge selfie on the way. The show was well-laid out and nicely organised. It was easy to move between stands, even if you did have to wait for your turn at popular stalls like Crown Brush Australia. There was a good mix of local, national and international companies touting their wares, make-up artist demos, education sessions, guest appearances and the AH&MS SA Make-Up Artist and Hair Stylist Of The Year competions. Being asked if we were hairdressers or make-up artists as we browsed around was hugely gratifying. Although with my basic face and weave, not likely. In related news, I really REALLY wanted some fake hair action, but Bridie wouldn't hear of it and physically slapped a hair scrunchie out of my hand. She has thick lustrous hair so doesn't get the struggle of fine hair problems. Seriously, if the fake bun had come in my colour, I'd have bought it while she wasn't looking. We toured the venue twice, looking at various items and swatching like cray. The back of my hand was a glorious riot of hot pink glitter, shimmery gold illuminator and peachy blush. I found myself desperate for 50-shade professional palettes,100-piece brush kits, the entire Girlee Glitz glitter range and a leopard print roller case. After much deliberation, we settled on a couple of Crown Brushes each and some beauty supplies like blending sponges and eyebrow stencils (okay, that was just me as I have neither brows nor skillz). Finally, a quick stop in front of the posing wall . . .
And it was back to North Adelaide for some sustenance, this time at The Store. Yes, I had banana bread for lunch, what of it? It's really worth getting out and supporting these events if you're in a smaller city to ensure they come back! 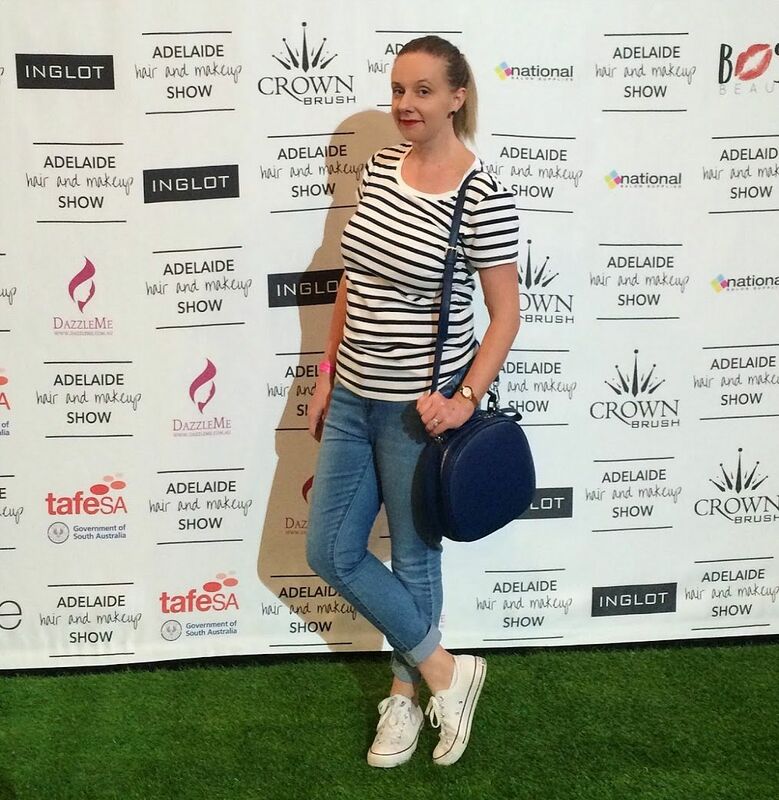 Props to Kohl & Capri PR who organised the show and here's hoping it will only get bigger and better from here. 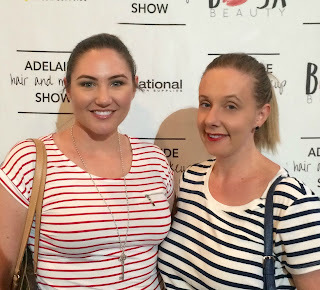 Also linking up with Ingrid at Fabulous and Fun Life for the Monday Makeup Madness Link Party! Is a hair and make-up trade show your kind of thing?